In the mela grounds, I asked a foreigner if I could sneak a peek at the day’s programme she was reading. She looked me straight in the eye and said, “Rs5 please." This was Pushkar, after all, and we burst into peals of laughter, which merged with the bells ringing on camel carts lined up at the fringes of the grounds. The carts were decorated like young brides in riotous finery—vibrant reds, fluorescent greens, oranges and royal blues, woven into nets and pom-poms. The cart drivers were all too willing to give you a ride, but only if you were a woman. I hoisted myself up and that ride through the main street of the town showed me something that I wasn’t prepared for. Colourful, chaotic, filthy, all at once in an all-Indian, organic panorama—it seemed the only way to be. Fitting, because it was to celebrate Brahma—the God of creation in the Hindu pantheon—that we had all congregated there. One of the several legends concerned has it that Brahma’s children were killed by the demon Vajra Nabha. To exact revenge, Brahma struck him with his weapon, a lotus flower. The demon died with the impact and the petals of the lotus drifted down to earth in three places. One of them was Pushkar (literally, born of a flower), where a lake sprang into being. Brahma is supposed to have performed a grand yagna (religious ritual) there on Kartik Purnima (the full moon day in the Hindu month of Kartik); till today, thousands flock there to commemorate the event. Decades ago, the West made Pushkar and the camel fair a synonym for big-ticket exotica. 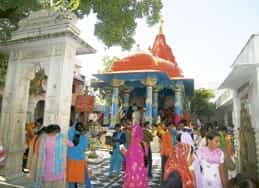 But, in the shadow of the cattle trade, the fair continues to be an occasion for villagers of the region to get together, for Hindu pilgrims to take a holy dip in the lake that gives the town its name and pay obeisance at the only Brahma temple in the world. Despite its ancient roots, Pushkar is far more modern than Jaipur. I took in German bakeries, Israeli cafés, Italian coffee, smartly cut pants and jackets for sale along with bright bamboos (used by cattle-owners), bandhini skirts, camel accoutrements, silver bracelets and spangly cholis. Pink Floyd, eternalized in a cyber café named Wish You Were Here, nestled in a corner with a halwai selling dal kachori. A palmist sat on the roadside with an array of semi-precious stones, chunky beads and Hanuman’s picture, garlanded and throned on a battered old trunk. With a hunched back, hennaed hair and a forehead smeared with gold acrylic paint, setting off sparks each time he turned his head to face the warm afternoon sun, he called himself Pushkar’s Nostradamus. “I’ve learnt to speak English," he said, which didn’t quite explain the Frenchman listening to him intently. “Take this tabeez (amulet), your work will get sorted out," he said. Run-ins with other similarly incomprehensible vows—all manifestations of a feverish will to submit to a power greater than oneself, even at the cost of ignoring the basic demands of existence—shook me up. One encounters all kinds of rites, rituals, belief systems in our country, and Pushkar is so real it frequently slips into the surreal. Yet it is not bhakti, that near-untranslatable sense of spiritual devotion, that we experienced there, but politicking priests. Religion is a business and worship is categorized. Our pandit took us to the ghats and told us, “You can choose to do puja worth Rs501, Rs1,001, Rs2,100, and above, there’s no limit." The waters of the Pushkar lake, spread over about 5 sq. km, were green and murky but people plunged into them with a fervour that surely had its own cleansing properties. As the chanting of pandits and devotees rose and fell like a symphony, our man dipped a saucer into the lake and made us sip the water. For that moment, gazing upon 52 ghats—the grateful gift of wealthy merchants—and the combined devotion of thousands, our concerns about water quality simply fell away and we sipped and prayed. Some of my rational self asserted itself as the pandit insisted I wash the husband’s feet with the words, “He’s your keeper." Shrugging off the unnerving patriarchal ways, we walked into a narrow alley, Pushkar’s food street, to devour hot puri aloo and malpuas. A spin over the dunes on a desert mobile (an adventure sports vehicle) later, we ended up at the cattle fair ground, the traditional livestock of camels now outnumbered by horses. Later, chatting with a Canadian who’s been coming to India every year since 1999, we tried to analyse Indian tourism. “The Incredible India campaign has turned things around but India has to back it up with the experience it promises," she said. “They’ve got the bone structure, now they need to add the meat." My mind wandered back to the palmist. “Wear this tabeez," he had said. What tabeez would Pushkar need to make its magic last? The Pushkar cattle fair is on from 5-13 November.